Vlad Dracula is credited with impaling 100,000 Ottoman Headcutters aka; Muslims and probably more. Founding Fathers First War Was Defending America From The Muslim ‘Brotherhood’ ~ Ottoman Empire: Treaty Of Tripoli. In 1462 when the invading Muslim Sultan Mehmed II reached Tirgoviste, he saw a terrifying scene, remembered in history as “the Forest of the Impaled”, there, outside the city, were 20,000 Muslim prisoners, all impaled. 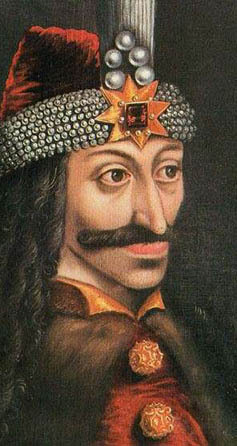 Sultan Mehmed II sent his envoys to speak with Vlad Tepes and when ushered into the presence of the prince, the Turks refused to remove their Phrygian caps. When questioned, they answered that it was not the custom of their fathers to remove their hats. Dracula then ordered their hats nailed to their heads with three nails so that they might never have to break such an excellent tradition. Dracula stated that when in my presence you will obey my customs. The envoys were then sent back to the sultan with their caps nailed to their skulls. Vlad (III) or Vlad Tepes, meaning “Vlad the Impaler”, the Muslim Turks called him Kaziglu Bey, or “the Impaler Prince”, was the prince of Walachia, and was born in Transylvania, which at that time was ruled by Hungary. 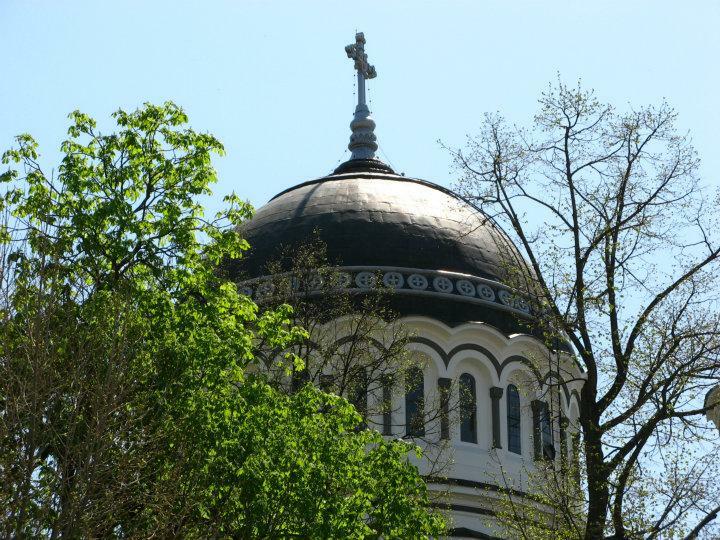 Walachia was founded in 1290 by a Transylvanian named Radu Negru, or Rudolph the Black. Dracula’s grandfather, Prince Mircea the Old, reigned from 1386 to 1418. He fought to keep Walachia independent from Islamic Turks but was forced to pay tribute to them. He and his descendants continued to rule Walachia, but under the suzerainty of the Islam Ottoman Empire (Turkey). The prince was elected by the country’s boyars, or land-owning nobles ‘We The People’. Eventually the royal House of Basarab was split into two factions — Mircea’s descendants, and the descendants of another prince named Dan (II). Dan’s descendants were called the Danesti. Mircea’s had a son named Vlad (II), born around 1390. He grew up in the court of King Sigismund of Hungary, who became the Holy Roman Emperor in 1410, and founded a secret fraternal order of knights called the Order of the Dragon to uphold Roman Catholicism and defend the Empire against the Islam Ottoman Turks. Its emblem was a dragon, wings extended, hanging on a cross. Vlad (III’s) father Vlad (II), was admitted to the Order around 1431 because of his bravery in fighting the Islam Turks. From 1431 onward, Vlad (II) wore the emblem of the order and later, as ruler of Wallachia, his coinage bore the dragon symbol. The word for dragon in Romanian is “drac” and “ul” is the definitive article. Sigismund made Vlad the military governor of Transylvania, a post he held from 1431 to 1435. 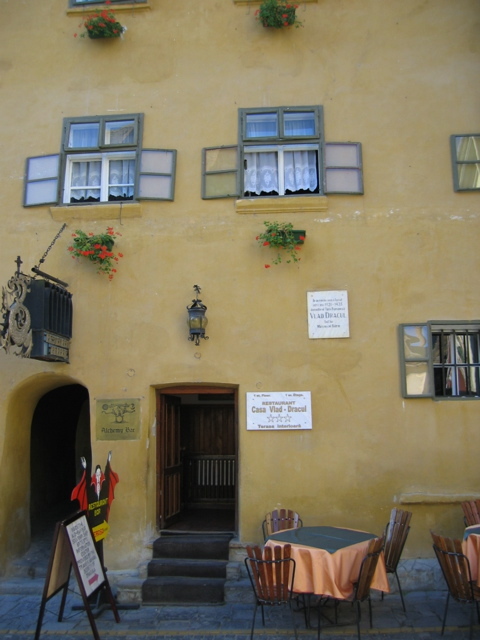 During that time he lived in the town of Sighisoara or Schassburg. 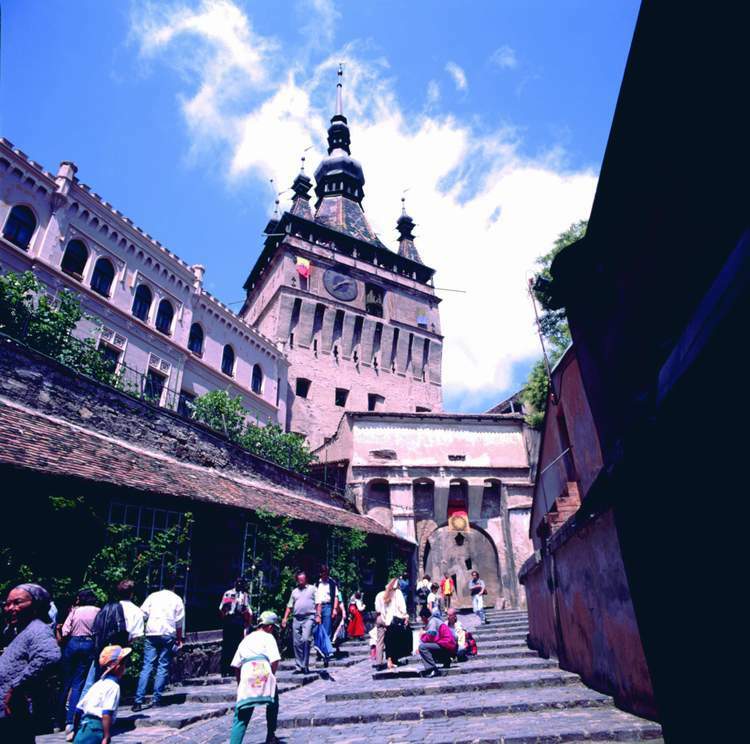 You can still visit the citadel there and even the house where Vlad’s son Dracula was born. 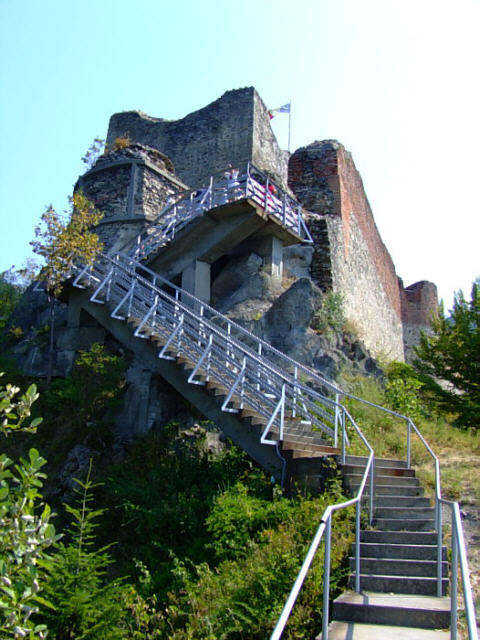 The birthplace of Vlad Tepes (Dracula). Today there’s a restaurant on the second floor. There’s also a mural in the house that depicts Vlad Dracul or Vlad (II). Dracula was born in November of 1431. 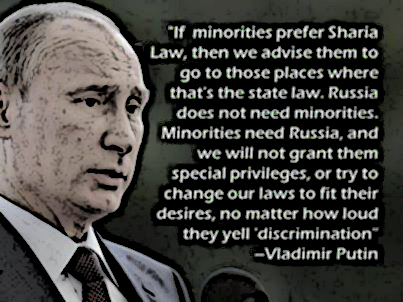 His given name was Vlad. He had an older brother, Mircea, and a younger brother, Radu the Handsome. Their mother was a Moldavian princess or a Tranyslvanian noble. It is said that she educated Dracula in his early years. Later, he was trained for knighthood by an old boyar who had fought the Islamic Turks. In 1462 when the invading Evil Muslim Sultan Mehmed II reached Tirgoviste, he saw the terrifying scene, remembered in history as “the Forest of the Impaled”, there, outside the city, were 20,000 Muslims prisoners, all impaled. The sultan’s officers were too scared to go on – Dracula had won again.He’s remembered today as a patriotic hero, who stood up to Islam (Turkey) and their expansionism. He was the last Walachian prince to remain sovereign and independent from Islam’s Ottoman Empire. 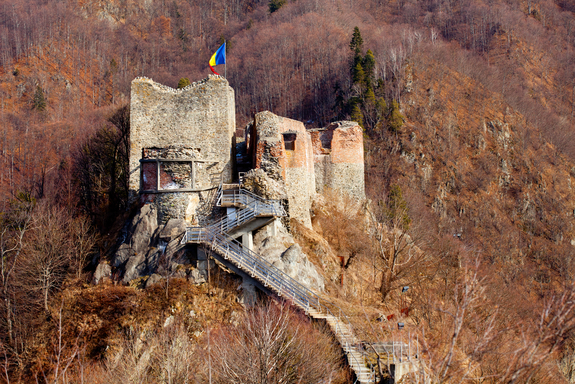 What Remains Of Poenari Castle in Romania also known to have belonged to Vlad Tepes for part of its history. Remember, The Discovery Channel Is A Tool Used For Reprogramming By The NWO, Who Also By The Way Utilize The Headcutters In Their Moves To Destabilize Nations. 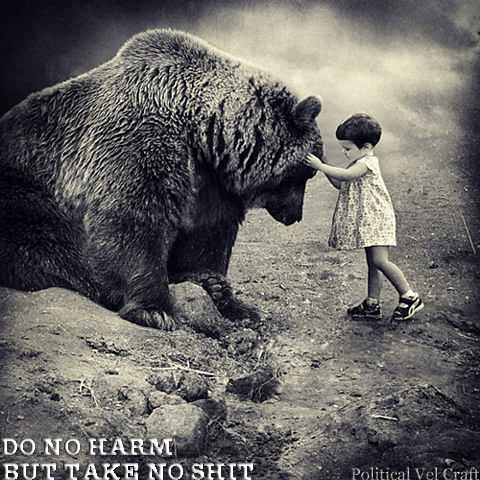 This Is Why They Labeled Vlad Tepes As Evil – When In Actuality, He Was The Hero Saving His Country From Evil Headcutters, Who Were Practicing Expansionism Throughout Europe. The Headcutters Of Islam Were All ‘Johnny Come Lately’, As Europe Was Either Already Roman Catholics Or Barbarians! This is Bran Castle which is used for Dracula Tourism ~ Vlad did sleep here on his visits, but His Castle is the one above. Vlad the Impaler was a great strategist, incredible leader, congratulated by the Roman Catholic Pope and Christian Kings for his victories against the Islamic Ottoman army. Vlad Tepes imposed the ultimate honesty among his people. He was loved by his peopled, feared by his enemies. Vlad Tepes is one of the most known leaders of the medieval period and the National Hero Of Romania. At the Battle of Poitiers in 732, the Frankish King Charles Martel defeated the Saracens (Muslims) and pushed the forces of Islam back into the Iberian Peninsula. It was not until 1492 that the Moors (Muslims) were finally thrown out of Europe, but in the meantime the Islamic virus was contained in Spain and Portugal, and thus kept out of the heart of Western Europe. 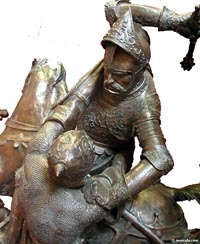 One of King Charles Martel’s comrades-in-arms at Poitiers was a warrior of the North known as Ogier le Danois, later Holger Danske, or Holger the Dane. 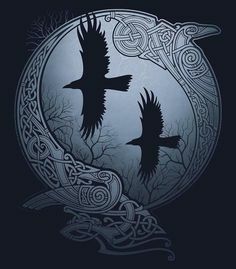 Although Holger was a historical figure, little is known of him, and most of the written material about him is drawn from legend. Inside Kronborg Castle Is The Statue Of Holger The Dane. Kronborg Castle or ‘Hamlets’ Castle was immortalised by Shakespeare. Kronborg is situated at Helsingør or “Elsinore” and built by King Frederik II in 1574-84 (King from 1559-1588 – ruled Denmark and Norway). It was within the first 100 Years after The False Prophet was born, Mudhead’s Islamic Headcutters began deceiving and murdering their fellow man. ← Obama Collusion: General Electric CEO For Economic Recovery Advisor!